"Just trust God," your friends say. If you're suffering from a loss, stressed over money problems or feeling overwhelmed with a busy schedule, you know that "just trusting God" is not easy. The path to trust and peace requires time to reflect on your life: your expectations, your schedule, and your relationship with yourself, others and God. 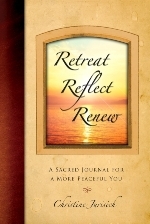 The Retreat, Reflect, Renew journal is designed to give you the personal retreat time necessary to do that. The short chapters allow you to reflect in 15-20 minute increments with beautiful prayers, scripture verses and reflection questions. A faith journey is not a one size fits all. You will come with your own story and that will be honored. Author Christine Jurisich spent three years in prayer and consultation with spiritual directors, retreat directors, family therapists, a psychologist, priests, nuns, and women engaged in a spiritual journey to develop a process that allows you to feel accepted wherever you're at on your journey and empowered to grow at your own pace and in your own way. Start your journey to peace today or give the gift of peace to a special someone in your life. PLEASE NOTE: Orders taken after December 18th will not be filled until December 28. PLEASE NOTE: Orders taken after Dec 18 will not be filled until December 28.